The ISME said many businesses can not afford to pay staff if they do not come to work. 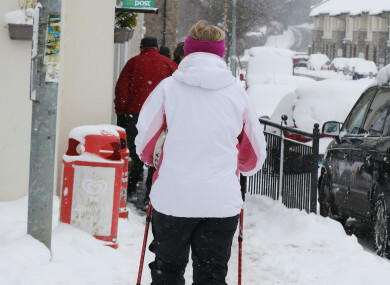 THE GOVERNMENT HAS been urged to tell employers to pay staff who can not make it to work because of the severe weather over the next two days. People Before Profit TD Bríd Smith criticised companies who are refusing to pay employees who can not get to their workplaces. “In many cases, public sector workers have been told not to show up for work, but in the same workplaces contracted private companies are telling their workers that if they do not show, they will have to take annual leave,” she said. “This is outrageous, potentially dangerous and grossly unfair to the workers involved,” she said. She said in light of advice issued to members of the public to stay home during the storm the Taoiseach should instruct employers to pay workers. Sinn Féin has already moved legislation on this issue and TD David Cullinane said today it is “utterly incredible that the Taoiseach believes the decision to open or close a business during a national weather emergency is a personal matter”. His party’s legislation would make it mandatory for all non-essential employees in places of employment subject to the alert are to be allowed to stay away from their place of work until the alert ends, with no loss of holiday entitlements or pay. The legislation would also impose penalties on those engaged in “reckless behaviour” in the midst of a severe weather warning, the TD said today. Yesterday, Minister for Business, Enterprise and Innovation Heather Humpheys said the “paramount and overriding concern” for the government, citizens and employers is safety. “Ultimately, it is up to each business in affected areas to decide whether they will stay open or close. However, when making their decision, I would encourage employers to consider the constraints on public transport and the current and anticipated snow conditions in their local area,” she said. She asked employers to recognise that demonstrating concern for the welfare of employees and treating employees fairly translates into a better working environment to the benefit of both the staff and the employer. The Irish SME Association reminded employers they have a duty of care to consider whether it is safe to ask employees to travel to work or to undertake their work. Where a business closure does not occur, it said business should allow flexibility for employees, especially those who have some distance to travel and consideration should be given to how long it will take staff to commute home safely. Speaking to TheJournal.ie this morning, ISME chief executive Neill McDonnell said there are small business who would not be able to afford to pay workers if they can not come in. “With some small businesses – barbers, cafés, and some man in van services, the payroll cost is over 80% of the business and they might be able to take a one or two day hit, but they are paying people out of money that isn’t there in the business,” he said. He said many businesses “got a scare” during Storm Ophelia when public transport stopped while some of their staff were still at work. Lessons had been learned, he said, and these businesses made plans and decisions earlier on. Are you working today? We want to hear from you. Email michelle@thejournal.ie. Email “Taoiseach urged to tell employers to pay staff who can't make it in during storm”. Feedback on “Taoiseach urged to tell employers to pay staff who can't make it in during storm”.